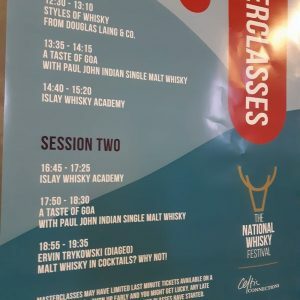 Blind Islay Whisky Tastings at National Whisky Festival for Celtic Connections, hosted by myself, Rachel. This is a wonderful event – filled with music and food and, of course, exceptional drams & people! People think in whisky tastings we focus on the whisky… ! Well, yes, we do. But we also focus on ourselves. So, if our own nosing & tasting perceptions are asleep, we lift the glass and experience very little. Think of the smell when you first woke up – did you smell the weather, was it raining? Could you smell freshly brewed coffee… did that waft of bacon sizzling in the frying pan tempt your tastebuds? Think of the smell of your toothpaste, your shampoo. Did you wear new leather shoes? How did you travel to the venue where you are tasting whisky? Did you smell diesel, the funky smell of the tube station? When you arrived at the venue, did you smell whisky – or excitement… what does excitement smell like? So first of all you start thinking about yourself experiencing different smells around you. The notes and aromas you get from whisky are not esoteric – they are normal. They are the same smells you experience in the day – the flavour notes of whisky can be broken down into categories. You don’t need to try and remember a flavour wheel. All you need to do is imagine you are walking along a street, and envisage all the different shops. Bakers, Butchers, Flower shop. Sweet shop, shoe shop. Spice shop. Then as you walk along the street you emerge out into the countryside – smells from a stable, a farmyard. A garage. Someone’s lovely garden. Think of the categories of smells as places and you can think through the smells you experience there. Then systematically go through each place when you are experiencing notes and flavours you don’t immediately recognise. A lot of whisky Nosing & Tasting is being systematic. 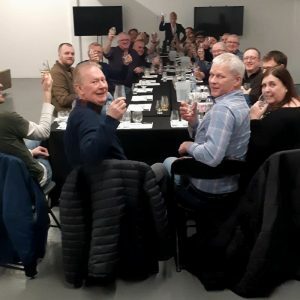 This is what people enjoyed learning at Islay Whisky Academy’s blind Islay Whisky Tastings – and drinking Bunnahabhain, Bowmore, Ardbeg and Laphroaig drams!